So I am the type of person who HATES heat and humidity-- so of course, it is art fair week! 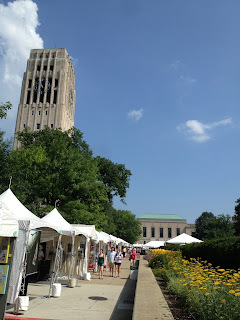 I was swearing that I was going to stay away, but we needed to pick up our new glasses at SEE, so we parked in the Maynard deck before 10 AM and started walking a couple of my favorite fairs. Most of the booths were open, and it wasn't too blazingly hot yet-- so it was actually pleasant. I just intended on looking for my favorite artists, but I discovered Orchid Lane-- and bought a sundress. This may not sound like a big deal, but I decided several--OK many--years ago, that my sundress days were over. Update! Global warming and beer festivals have made me reevaluate that decision. So I found a nice cotton dress that wasn't too short-- and didn't look too much like a muumuu. And what could be better? It was $15! So if you were like me, and assumed that this was a college kid shop and the largest size was 6, check it out. You will be pleasantly surprised. Just channel your inner hippy-chick (you know she's still in there! ), and buy yourself something nice and cool. Not sure how it will look? There is a fitting room in the store. So then it was getting pretty hot, and I had made it to 11:00 without complaining too much or passing out or anything, so we dove into Ashley's. 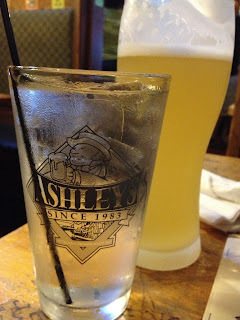 It was nice and cool and dark, and the very cheerful waiter brought us pint glasses of ice water before taking our beer order. It seemed like good weather for a nice wheat beer, so I got a refreshingly cold Wittekerke, a Witbier from Belgium. Even if you're not a beer fan, this is the one to try during hot weather. Then we made the best discovery! We each ordered a Maurice salad, as it just didn't seem right to order red meat or anything deep-fried in this heat. It was excellent! All together, a nice morning. And we were home in the air conditioning, by 12:30. Perfect. My art fair trip consisted of 2 hours on Sate St, short walk down Liberty and 1 hour at Cafe Felix for wine and a crab cake sandwich. perfect!!!! New! 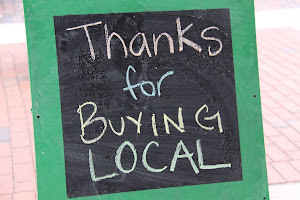 Like RetiredinAnnArbor on Facebook! 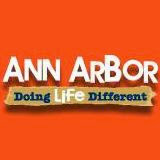 What's new in Ann Arbor? Travel like "Retired in Ann Arbor"